For most classic car owners owning a classic car is not about a rising investment (which is always a nice perk) but about owning what they like. For most classic car owners, their classic cars are rolling nostalgia – bringing back long lost fond memories of youth. Maybe that special car was a car that you always wanted but postponed owning due to marriage, kids, and other circumstances life can throw at you. Or maybe a certain car you owned was enjoyed and sold due to the prior reasons and finally after years of regret another just like it is finally sitting in your garage. And then there are the lucky few who buy their dream car in their youth and are able to keep it through the many years even during the hardest of challenges. 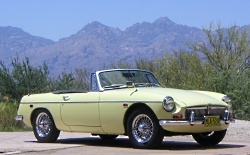 Ron Kobernik is one such lucky fellow, for the last forty years he has owned a 1969 MG MGB roadster. Like a good marriage, his car has been with him through thick and thin. Kobernik is not your normal classic car owner he has been both an Air Force and civilian pilot. He has flown many aircraft in his day including the Lockheed L1011 jumbo jet for a major airline. So he’s no stranger to expensive modes of transportation, however over the years when he’s on the ground his 1969 MG MGB has been his preferred mode of transportation. He’s part of a smaller group of car aficionados who came of age in the 1960s who took to the European sports cars during an era when most young males from 18-30 years of age were clamoring for GTOs and other hot V8 powered muscle cars. It was this very crowd that made Triumphs, MGs, and other British sports cars so popular in the 1960s and 1970s. 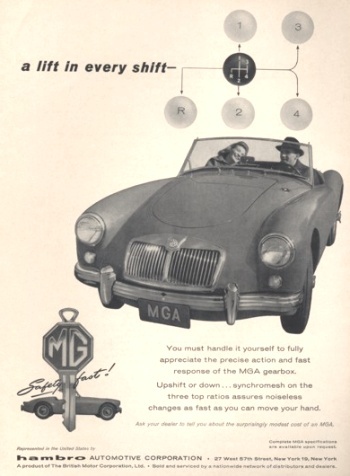 The MG division of the British Motor Corporation had a good run with the MGA sports car which was the MGB’s predecessor. The MGA which was first introduced in 1955 took the auto world by storm; it was a stunningly attractive sports car which had the handling and power to back up its looks. When MGA production ended in 1962, it was the new MGB sports car that was its replacement. Filling the shoes of the MGA was a tall order however the MGB was willing and able. As attractive as the MGA was, the MGB was a more modern version that was pleasing to MGA fans but was also state-of-the-art and attractive enough to lure in new buyers. The styling was in fact so pleasing and modern the MGB only received slight styling updates from time-to-time over its almost twenty year run. When MGB production ended in 1980 the MGB had remained intact with the same basic styling lines it had first introduced to the world back in 1962. The only real noticeable deviation were the big full length rubber bumpers (instead of chrome bumpers) which were added in the 1970s to meet U.S. mandated bumper standards. 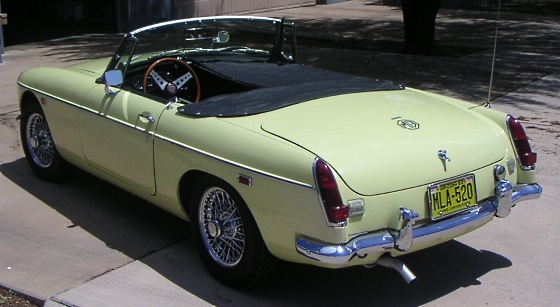 The MGB utilized a monocoque structure which was much more advanced than the typical body-on-frame design of that era. The monocoque structure allowed great weight savings along with giving the added benefit of stronger construction than the typical body-on-frame structure. The new 1961 Jaguar XKE which was Britain’s flagship sports car and the envy of the world also used a moncoque structure. The MGB proved to be a very popular sports car for those who wanted a small good handling sports car with good acceleration for a reasonable price. Where the Jaguar XKE was only within reach back in the day for the upperly mobile and the country club scene, the MGB was within reach for the average person who wanted a flashy fun sports car. For MG this formula certainly paid off; MGB sales were very good and the MGB soon became a common sight on American roads. Its popularity continued on through the 1970s. Like most British cars of this era the MGB did have a few reliability issues in comparison to comparable American cars, reliability however did improve as MGB production continued. But it was the ever changing stringent U.S. Government safety and emissions regulations that convinced MG to stop importing its cars to the U.S. – in effect removing the MGB from the U.S. market (Triumph, a MG competitor also suffered the same fate). With MG and Triumph having left the U.S. market, no inexpensive 2-seat sports cars were available to American buyers until the mid-engine 2-seat Pontiac Fiero would be released for the 1984 model year (it encountered much better than expected sales). The Fiero was an inexpensive attractive sports car – however it was plagued with some problems, bad press, and GM’s unwillingness to spend the money to make it a solid sports car. The Fiero would spawn a mid-engine competitor from Toyota (the MR2) however the fun little inexpensive front-engine 2-seat concept that MG made so popular would not be seen again until Mazda released for the 1990 model year its version of the MGB – the Miata MX5. Mazda so closely followed the old MGB formula that the Miata has been around for twenty years with no end in production in sight for the foreseeable future, proving that if MG had stuck around in the U.S. it probably would have had the same success. Getting back to Ron Kobernik, the MG fever first struck when he purchased a used 1957 MG MGA back in the early 1960s. He later gravitated to a 1966 VW Beetle but as circumstances would have it, he would soon be back in the MG motoring world with the purchase in January 1971 of a 1969 MGB roadster. The interesting twist in this story is that at the time Ron’s future wife Cathy was responsible for his purchase. It all started when his 1966 Beetle was on its last legs and he was looking to replace it with some reliable transportation when Cathy who had the idea to look for something for sale in the paper that would as she said “get him excited.” She soon thereafter discovered an ad for an ultra low mileage 1969 MGB roadster. It was not too long after discovering the ad both he and his future wife were looking at the MGB, which Ron remembers upon first sight as being “gorgeous.” But it was the test drive that had him sold on the purchase. Like most smart buyers who stumble across something too good to turn down, he didn’t haggle on the price he agreed to buy the MGB for the seller’s asking price of $2,300. 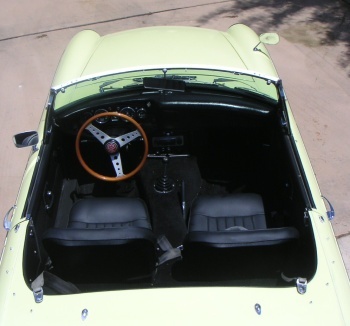 For this MGB was not your typical two year old used car. There was indeed another twist to this story, like a lot of classic car stories one person’s gain is another person’s loss. The original owner of the MGB was a doctor named Ginny who had bought the car new from a Manhattan MG dealer as a present to herself for her recent graduation from medical school. Ginny like Ron was immediately smitten with the car upon first sight and just like Ron she did not haggle on the price of the car – she asked the salesman what the asking price was and she wrote out a check for that amount. When Ron stumbled across Ginny’s MGB roadster for sale it looked as if had just rolled off the dealer showroom floor. When Ron purchased the MGB it had less than 3,000 miles on the odometer which was very low for a 2-year old car especially when you consider most of the miles were from the 2,400 mile road trip when Ginny moved from New York City to Tucson. Like many classic cars that have had the same owner for many years there are a lot of memories associated, Ron’s MGB is no different. Ron laments on how shortly after buying his MGB and after his graduation from the University of Arizona he drove from Arizona to Lake Tahoe on the Nevada highways exceeding over 100 mph in order to propose to his future wife. The 1969 MGB could not compete when it came to acceleration with the burly muscle cars of this era (it took a little over 12 seconds to reach 0-60 mph and over 18 seconds to hit the 1/4 mile) however its 1.8 liter four cylinder motor rated at 92 horsepower and 110 lb-ft of torque was strong enough to get the MGB into triple digit speed territory. On the other hand at these speeds the MG was very balanced and seemed more at ease (than your typical muscle car) due to its sports car stance and strong monocoque structure. One added bonus of the MGB was it was extremely fuel efficient which was not important back in 1969 but after the 1973 oil crises when gasoline prices skyrocketed this sent many performance fans flocking to new and used MGBs. 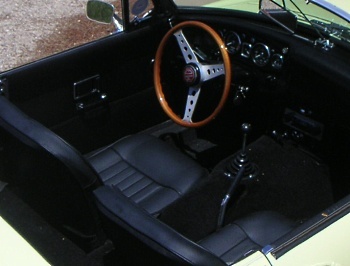 The MGB proved to many that a fuel efficient car need not be dull and uninspiring. Ron would use the MGB as his daily driver throughout his Air Force career. It would only see a brief storage period during this time when he was a pilot serving his country in Vietnam. Upon his Air Force retirement back in 1988, he was nearly killed on California Highway 12 near the sloughs in the Sacramento Delta when a pickup towing a trailer hit head-on at 55 mph the car directly in front of him. Unfortunately his luck ran out shortly thereafter as he progressed on his journey to Tucson when near Harris Ranch (Coalinga, California) on Interstate 5 the MGB’s engine spun a bearing. The MGB then spent the next five years in storage until Ron had the funds to rebuild the engine. Fortunately after that it was back on the road and has remained so until this day. The MGB has long since been retired from daily driver duty. Ron still drives it on a regular basis continuing to remember all the good memories including when he would put a child car seat in the MGB and take his children (one at a time) when they were toddlers out for ride when he was running errands. The MGB will go down in history as a fun and beautiful sports car the average person could buy. Its classic lines will continue to appeal to future generations who never lived through the MGB’s era. And for MGB owners like Ron the MGB will continue to serve as a rolling piece of nostalgia. Ron gives his MGB the best compliment a car can get – “we have grown old together over the last forty years and she has aged a lot better than I have.” For Ron the MGB is part of his family, and it will remain so for many years to come. It’s all the fond memories that make his MGB a rolling reminder of Kobernik family nostalgia. Special thanks to Ron Kobernik who provided the pictures and information used in this article about his MGB roadster.